There are 28 reviews of Séville à l'Aube. The petitgrain- olive blossom opening is interesting to say the least: slightly citrus; almost resinous; and olivey but not blossomy. I like it – it’s almost green, a bit fresh, and extremely easy to live with. What makes the opening accord interesting for me, is the tinge of lavender that sneaks into the accord from the middle, which, somehow, makes everything seem reminiscent of the Mediterranean. And this opening accord lasts incredibly… petitgrain has that tendency. When the petitgrain / olive blossom accord calms down, the orange blossom / lavender begins moving in and the result is a smoother, more floral, lower-key texture which still retains the edges of the petitgrain / olive core. I’m not sure how the competency of this heart accord is accomplished: I can’t separate out the beeswax / tobacco from the middle accord, but the heart is definitely a worthy successor to the opening IMO. With the base, the incense moves in and out of the still-familiar accord that has been performing from the beginning... This base accord performs with a definite loss of strength from the heart. It is reticent… near skin scent, actually, and its slight aromatic eminations are quite beautiful… very nice but sadly, demure. 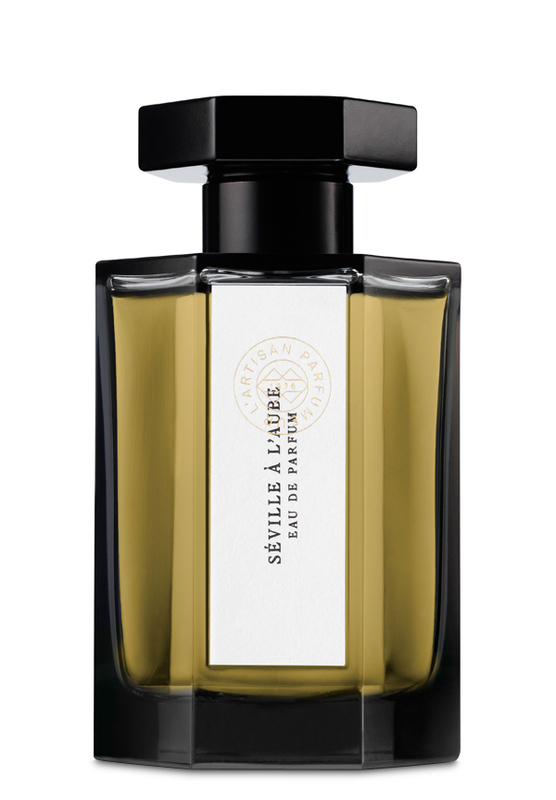 Séville à l'Aube is an accomplished fragrance. I admire its originality and its performance – especially through its opening and heart... and I’m not too put off by the demureness of its base. 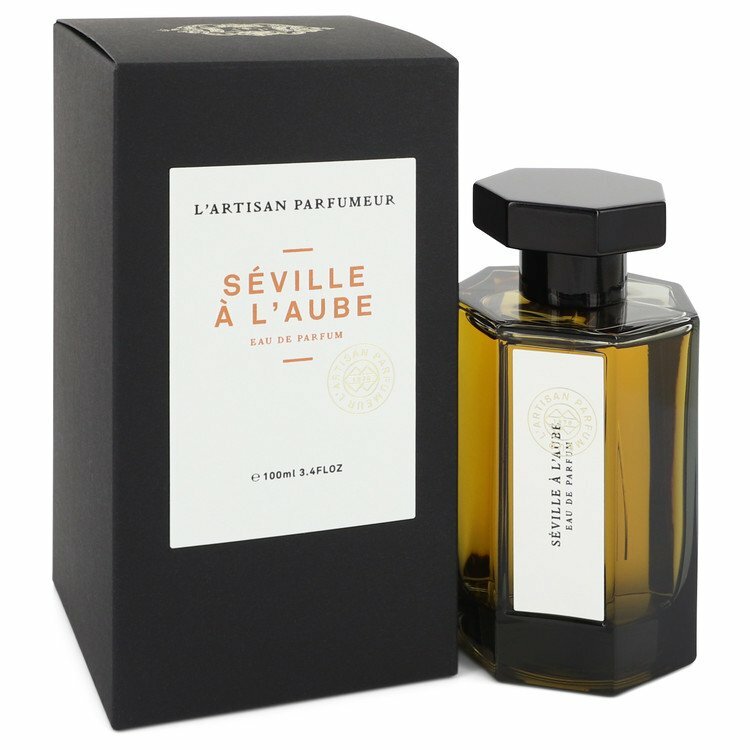 Séville à l'Aube is sweet orange and incense with a nice tarry edge along with some honey. I like it but can sometimes find it a little cloying. It doesn't really make me think of Seville or even Spain, but it is one of the few perfumes that I think only works at night, and outside on a summer's night if possible. In this warm night-scented floral incense vibe, it has a midnight in an exotic garden feeling, but for me it isn't muscular enough to evoke Spain. But then again, there is a certain honeyed orangey tobacco tinged feeling to the drydown that may indeed be Seville. I can't recall the last time I so badly wanted an opening accord to last forever. Smelling this is like cracking open a classic petitgrain and lavender men's frag from the 40's or 50's which has been trapped in amber. It's sweet, bitter, aromatic, and warm, and the orangey-amber glow reminds me more than a little of Minotaure and New York, those beautiful Mediterranean Orientals. While the top phase is most definitely the more enjoyable part of the fragrance (but so very short-lived! )I really enjoy l'Aube. Even if there is a tad too much benzoin involved the heart of it smells like the simultaneously dirty-resinous-powdery effect achieved before in Ungaro II and Jicky. I can't help but wonder if my naturally dry skin tones down the sweetness a little, because it doesn't come off as cloying on me but there sure are a lot of folks who don't like this one because of the sweetness and volume it provides. All completely reasonable, but this one is an unshakable 'Yes' from me. Seville A L'aube By L'Artisan Parfumeur Eau De Parfum 3.4oz 100ml "TSTR"
There are no member images of Séville à l'Aube yet. Why not be the first?